Follow signs from airport for Route 93 south. Follow Rte. 93 south approximately 9 miles to junction of Rte. 3. At junction, bear left (two lanes) to join Route 3 south (Plymouth/Cape Cod). Proceed south to exit 14 (Rte. 228, Hingham/Cohasset/Rockland). At bottom of ramp take a left on Rte. 228 at the set of lights. Turn right at first light (after Home Depot). Take first left into Assanippi Park / Longwater Drive. 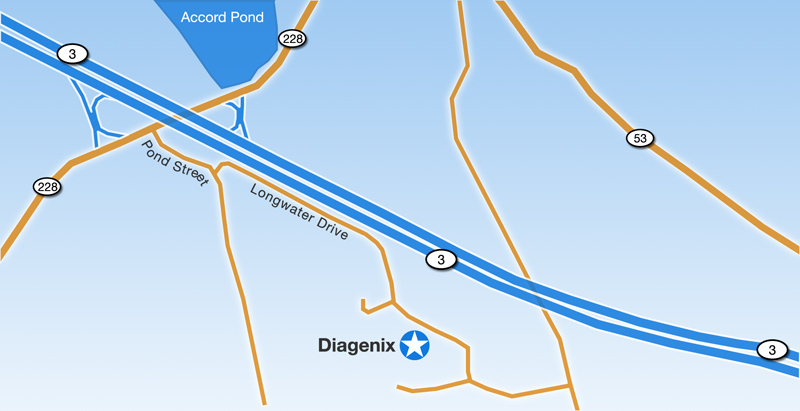 Diagenix is located at 106 Longwater Drive which is located on the right across from Wear Guard. Take Mass Turnpike (Rte. 90) or Route 95 to Route 128/93 south. Continue on Rte. 128 south to junction of Route 3/93. Bear right at split onto Rte. 93 south (Plymout/Cape Cod). Proceed south to exit 14 (Rte. 228, Hingham/Cohasset/Rockland). At bottom of ramp take a left on Rte. 228 at the set of lights. Turn right at first light (after Home Depot). Take first left into Assanippi Park / Longwater Drive. 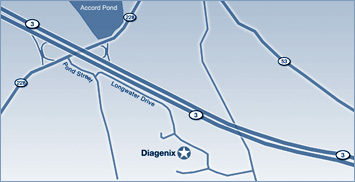 Diagenix is located at 106 Longwater Drive which is located on the right across from Wear Guard. Boston Logan International airport is located 22 miles from our office. Driving time is approximately 30 minutes. During construction and commute hours (North: 6-10am, South: 3-7pm) allow 1 hour for travel. T.F. Green airport in Providence, Rhode Island is located approximately 57 miles from our office. Driving time is approximately 1 hour. During commute hours (North: 6-10am, South: 3-7pm) allow 1.5 hours for travel.